Before they catch their breath, you magically produce one more big fat, lip-smacking kiss from inside the Chocolate Can O'Mystery. And who said "a kiss was just a kiss"? 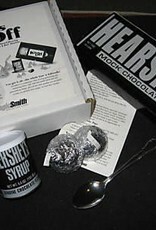 Now, if that wasnt enough, you turn over the can to reveal ts even more chocolate inside! Thats because its totally and completely sealed! In other words, both ends have never been opened! You guessed it-sealed with a kiss. You get it all-the whole kiss 'n kaboodle! 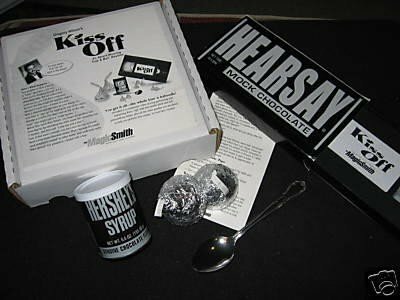 Included is a companion VHS video tape of Greg performing and explaining Kiss Off, with 2 jumbo thick and rich polyurethane kisses, plus the VHS tape, sealed Hershey's can of syrup, a Kiss Off tips card and spoon to help you perform this unique 'in your face' routine.